This is a definitive list of the German-speaking inhabitants of colonial Georgia.Composed of Salzburgers from Austria, Palatines from the southern Rhineland, Swabians fromthe Territory of Ulm, and Swiss, the so-called Georgia "Dutch" represented the largest ethnicgroup in Georgia in the mid-18th century. Their descendants are today scattered throughout thefifty states. This list of settlers in Georgia up to 1741 is taken from a manuscript volume of the Earl of Egmont, purchased with twenty other volumes of manuscripts on early Georgia history by the University of Georgia in 1947. The 2,979 settlers are listed in alphabetical order, followed by their age, occupation, date of embarcation, date of arrival, lot in Savannah or in Frederica, and (where applicable) "Dead, Quitted, or Run Away." Footnotes give additional information concerning many of the people listed. 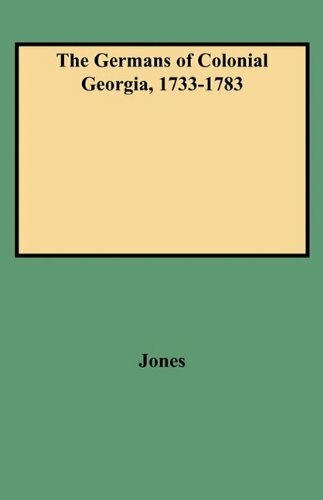 This volume was published in 1949 to help scholarly research in the history of colonial of Georgia. Pubisher's Synopsys of the 2006 reprint edition by Clearfield Publishing. This is a list not only of the early settlers of Georgia but of the first settlers of Georgia, and it is apparently a complete list of all those who were sent by the Trustees for Establishing the Colony of Georgia in America under Oglethorpe and the Earl of Egmont. 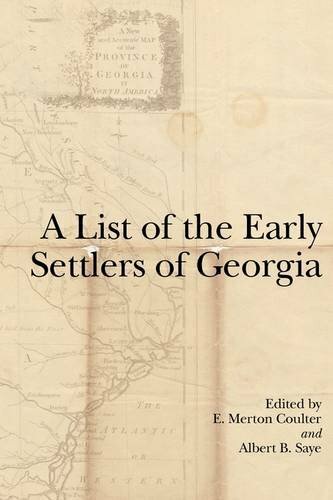 Based on the Egmont manuscripts, now in the possession of the University of Georgia, this list of settlers is given under two headings: first, those who went from Europe to Georgia at the Trustees' expense; and, second, those who went on their own account. Covering the period from 1732 to 1741, these two lists together contain the names and details of 3,000 immigrants, most of whom were assigned lots in Savannah and Frederica and a good number of whom would soon leave the colony for the Carolinas. Information pertaining to each settler consists, generally, of name, age, occupation, place of origin, names of spouse, children and other family members, dates of embarkation and arrival, place of settlement, and date of death. 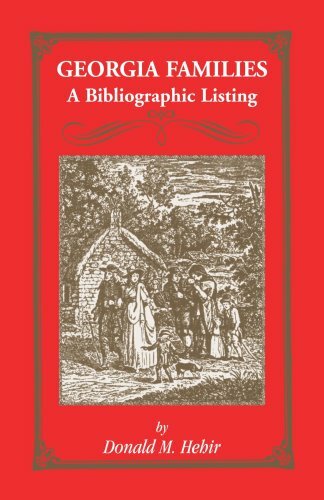 In addition, some of the more notorious aspects of the settlers' lives are recounted in brief, telltale sketches, which enable the researcher to divine something of the character of the colony and the times. 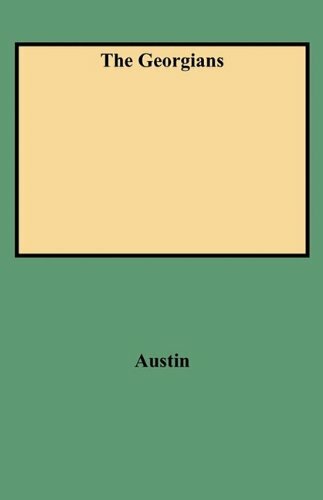 This is a collection of 283 genealogies which Mrs. Austin compiled over a period oftwenty years as a professional genealogist. Taken as a whole, it represents a cross-section ofpioneer Georgia families, and its publication is intended to assist others researching these samefamilies. Although the earliest Georgia settlers were brought in by General Oglethorpe in 1733, themajority of the settlers--from Connecticut, Maryland, Virginia, and the Carolinas, arrived afterthe Revolution, taking up bounty grants, joining in the land lotteries, and settling landssurrendered in the Indian treaties. 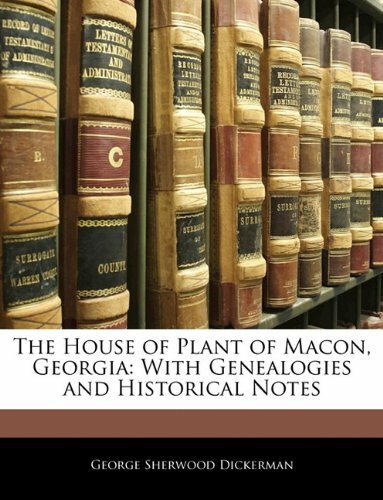 While this work deals with some of Oglethorpe's settlers, thevast majority of the genealogies deal with Georgians who descend from settlers from otherstates. For each tax list a great deal of information is provided that cannot be found in any other record source. 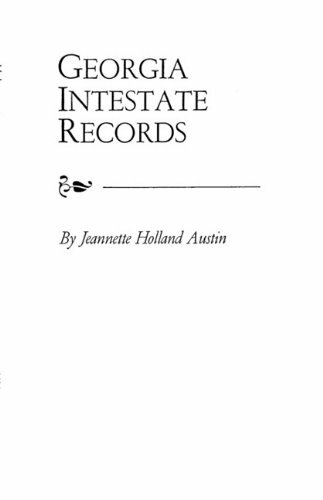 For example, each tax list generally gives the name of the taxpayer, the name of the adjoining property owner, and the name of the original grantee of land--information impossible to find in a census record and of the utmost importance in genealogical research. In addition, though less relevant genealogically, the tax lists identify the number of slaves attached to the property, the watercourses, the acreage, and the value of the land. The 1864 Census for Re-Organizing the Georgia Militia is a statewide census of all white males between the ages of 16 and 60 who were not at the time in the service of the Confederate States of America. Based on a law passed by the Georgia Legislature in December 1863 to provide for the protection of women, children, and invalids living at home, it is a list of some 42,000 men--many of them exempt from service--who were able to serve in local militia companies and perform such homefront duties as might be required of them. In accordance with the law, enrollment lists were drawn up bycounties and within counties by militia districts. Each one of the42,000 persons enrolled was listed by his full name, age, occupation,place of birth, and reason (if any) for his exemption fromservice. Sometime between 1920 and 1940 the Georgia Pension and RecordDepartment typed up copies of these lists. Names on the typed lists,unlike most of the originals, are in alphabetical order, and it isthese typed lists which form the basis of this new work by Mrs. NancyCornell. Checking the typed lists against the original handwritten records on microfilm in the Georgia Department of Archives & History, Mrs. Cornell was able to add some information and correct certain misspellings. She also points out that no lists were found for the counties of Burke, Catoosa, Chattooga, Dade, Dooly, Emanuel, Irwin, Johnson, Pulaski, and Wilcox.